After listening to "Wild," and being completely blown away, I immediately checked "Tiny Beautiful Things: Advice on Love and Life from Dear Sugar" on Overdrive. I was just as impressed, enamored, and fulfilled by this collection of advice columns as by Strayed's memoir. Strayed was the advice columnist anonymously penning the Rumpus's "Dear Sugar" column for two years. Through this role, she gave heartfelt advice to readers facing problems ranging from complicated to simple, unusual to common, specific to broad. Her advice invariably transcends the context in which it is given, as Strayed draws from her personal history to give the best advice she can. Like in "Wild," Strayed lays her personal history bare, sharing stories of her marriages, her children, her volatile relationship with her father, the death of her mother, drug abuse, and theft. Yet whatever walk of life you tread, you will find something in her advice that speaks to you. Above all else, Strayed encourages readers to be the best version of themselves, striving for a life of truth, self-care, and compassion for others. No matter the trouble you're facing, this broad principle is applicable and her advice will resonate. Reading this book is like being wrapped in a word-hug as Strayed soothes the fears you didn't know you had. She doesn't shy from giving tough love when required, but couches it in the most comforting of tones. She narrates the audiobook herself, ensuring that her tone of voice is exactly that she intended when she initially wrote the piece (a subject I occaisionally pondered when listening to "Wild"). Most impressive, she avoids judgement toward her letter-writers, addressing their situations as manifestations of the troubles we all face, whether self-caused, imposed by others, or produced by something larger. I'm bummed that "Dear Sugar" appears to have gone dormant, but look forward to flipping through the archives to read the columns that didn't make it into this book. Verdict: Affirmed - whether you feel emotionally adrift or like you have everything together, this collection of advice will give you a fresh perspective on whatever ails you. 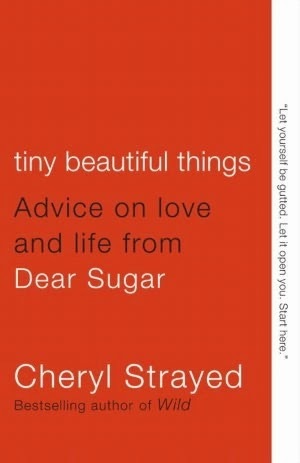 "Tiny Beautiful Things: Advice on Life and Love from Dear Sugar" by Cheryl Strayed, published by Vintage Books on July 10, 2012.